At Destination Dentistry in Custer SD, we go to great lengths to help our patients feel comfortable. We use communication to promote peace of mind, and offer sedation to those patients coping with dental anxiety. 1. We don’t judge you. We’ve devoted a professional career to promoting oral health and creating beautiful smiles. The team at Destination Dentistry is here to help you, regardless of the state of your teeth. We have treated patients with severe tooth neglect, advanced gum disease, enamel erosion caused by eating disorders, tooth damage caused by illegal drug use, baby bottle tooth decay, tobacco-stained teeth: in short, every imaginable issue. 2. We protect you from pain. We use novocaine to eliminate or minimize pain. 3. We help you with your dental anxiety. Fear of the dentist is far more widespread than you might realize. The perceived loss of control, instruments poking in your mouth, and teeth being worked on is not pleasant. Sedation dentistry not only helps with pain management, it allows you to drift through your appointment. 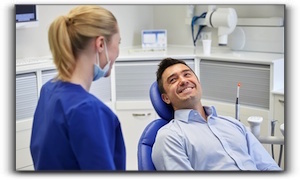 We offer nitrous oxide (laughing gas), which has been used in dentistry for more than a century, and oral conscious sedation, which involves taking a sedative before your procedure. Both are safe and effective. If you have postponed dental treatment for any reason, we encourage you to give Destination Dentistry in Custer SD a try. In addition to sedation, we provide family dentistry, and popular cosmetic dentistry procedures like professional teeth whitening. Schedule an appointment with us today.